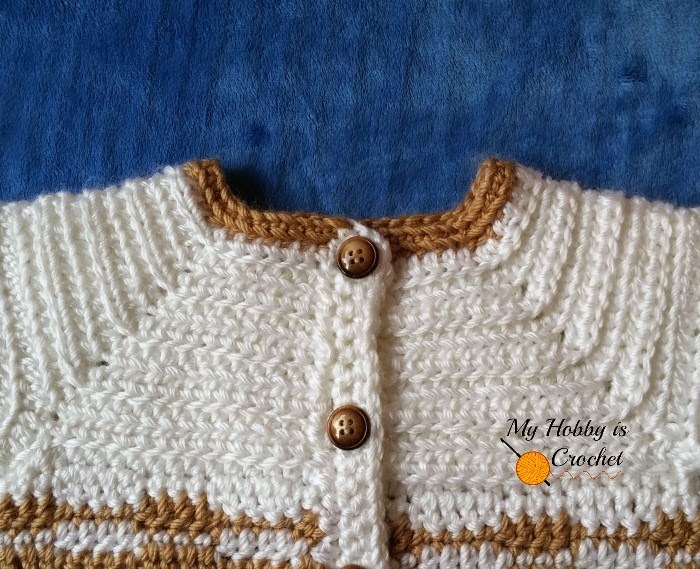 This cute crochet baby sweater was designed for a baby boy, but if you would change the colors, place the buttonholes on the other side and add a cute applique, you'll have a sweet little sweater for baby girls. In my opinion, it' s a perfect unisex sweater pattern. See the scheme below! All measurements are in cm. - back bump behind the chains: (see my TUTORIAL) Working into the back bump of the foundation chain will give the edge a nice, finished look. 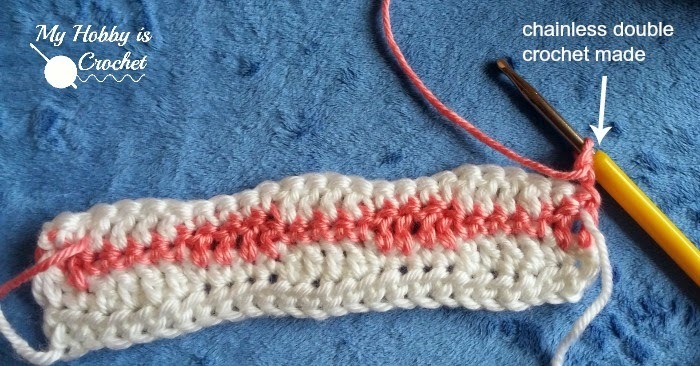 - csdc: chainless starting double crochet (See this Tutorial by Moogly). If you do not master the chdc, you could replace it with ch3. Notes: The cardigan is worked top down in rows, turning the piece after each row. For the yoke, on the right side all the stitches (including the V-sts) will be worked into the back loops of the stitches from previous row; on the wrong side all the stitches (including the V-sts) will be worked into the front loops of the stitches from previous row. With yarn color A start with 47 chains. Row 10 (flo): Separating for sleeves: 1 hdc blo into each of next 15 sts, ch 5 (for underarm), sk 24 sts, 1 hdc flo into each of next 32 sts, ch 5 (underarm), sk 24 sts, 1 hdc flo into each of next 15 sts, ch 1 and turn. Note: Don't cut yarn when making color changes, carry the yarns not in use from row to row. Row 12 : 1sc into first st, 1 sc in next st, 1dc in each of next 4 sts, *1sc in each of next 4 sts, 1dc in each of next 4 sts *; repeat from * to *, ending with 1sc in each of last 2 sts, with color change at the last st, this way: at the last pull through to complete the stitch, change to color A. Turn. 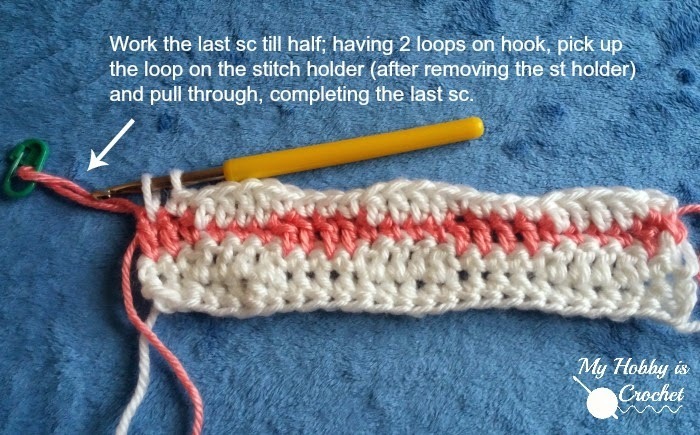 Row 13 : With yarn color A, make a chainless double crochet (this will be the first st), 1dc into next st, 1sc into each of the next 4dc, *1dc in each of the next 4sc , 1sc into each of the next 4dc *; repeat from * to * till last 2 sts, ending with 1dc in each of last 2 sc. DO NOT CUT yarn A! 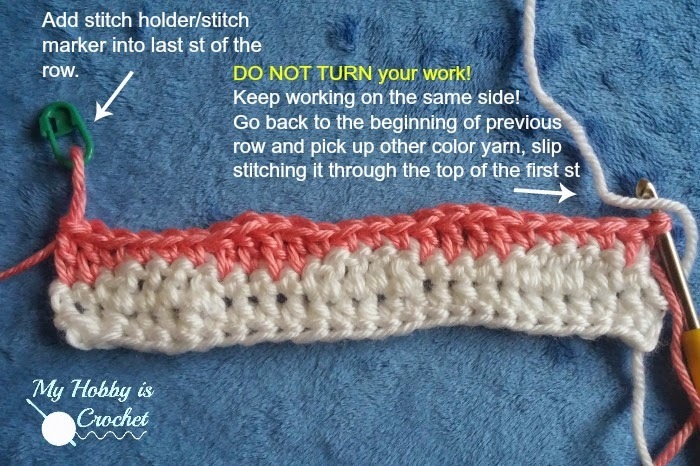 Remove loop from hook and insert a stitch marker/ stitch holder into the loop. See picture below! DO NOT TURN your work! Keep working on the same side! Go back to the beginning of previous row and pick up the yarn color B, slip stitching it through the top of the first st; ch1, 1sc in first dc, 1sc in next dc, 1 dc in each of next 4sc, *1sc in each of next 4dc, 1dc in each of next 4sc *, repeat from * to *, ending with 1sc in each of last 2dc, final sc this way: insert hook into last st, pull loop through, remove yarn B from hook, pick up loop of yarn A from stitch holder and finish the last st with yarn A. Turn. Rows 15-30: repeat as row 13 -14 with corresponding color changes, turning your work only when both strand of yarn A and B are at the left of your work. Row 31: ch1, 1sc in each st across. Turn. Row 32: ch1, 1sc in each sc across. Don't cut yarn. Continue with the edging. 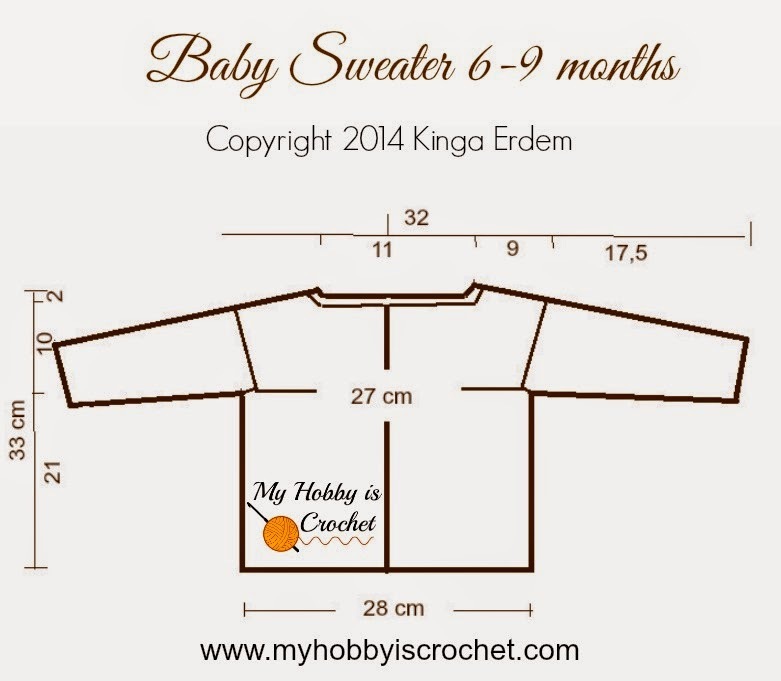 Note: If the sweater will be made for a baby girl, change the button holes on the other side, girl version below! Row 2: 1 sc in each st across, ch1, turn. Row 3: 1 sc in each st across. Cut yarn. Fasten off. Row 1: Join yarn with standing sc into top corner at neck edge, sc evenly across right front edge till bottom corner (having the same number of sts as for the left side, 38 sts); ch 1, turn. Note : To make it easier, you can add stitch markers to mark the button holes. Row 3: 1 sc in each sc and ch1 space across. Cut yarn: Fasten off. Weave in the ends. With sewing needle and sewing thread, sew 4 buttons on the right front side, each button corresponding to the buttonhole on the left front side. Row 1: Join yarn color B with standing sc into bottom corner, sc evenly across right front edge till neck edge (having the same number of sts as for the left side); ch 1, turn. Row 3: 1 sc in each sc and ch1 space across. Cut yarn Fasten off. Note: The sleeves will be worked into round; after joining into round, ch 1 and Turn, working on the opposite site!! 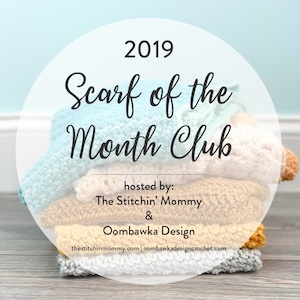 This will create the same texture the yoke has! 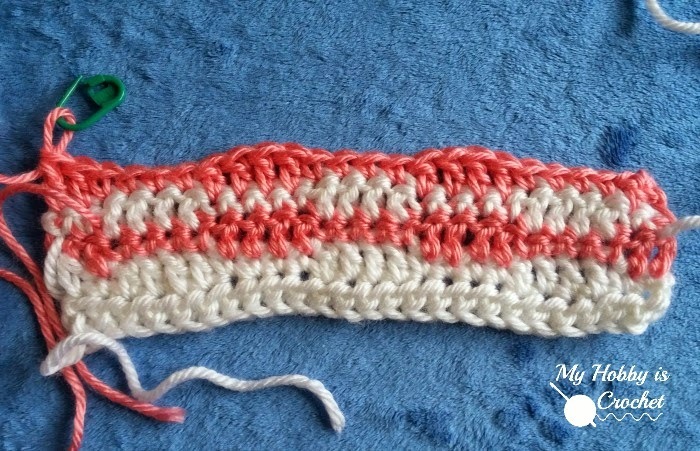 On the right side, the stitches will be worked into the back loops of the stitches from previous row; on the wrong side the stitches will be worked into the front loops of the stitches from previous row. Decrease tip: to form the sleeve, you will decrease 2 stitches every 4th round on the right side, this way: work 2hdc tog at the beginning of round (at underarm) and work 2hdctog on the opposite side (on the top edge). Round 2 (flo): 1hdc flo in each hdc around, join with sl st to first st, ch 1 and turn. Round 3 ( blo): 1hdc blo in each hdc around, join with sl st to first st, ch 1 and turn. Round 4 (flo): 1hdc flo in each hdc around, join with sl st to first st, ch 1 and turn. Round 17: sl st into next st and in each st around. Cut yarn and fasten off invisibly. Weave in the ends. Second sleeve: repeat as for the first sleeve. 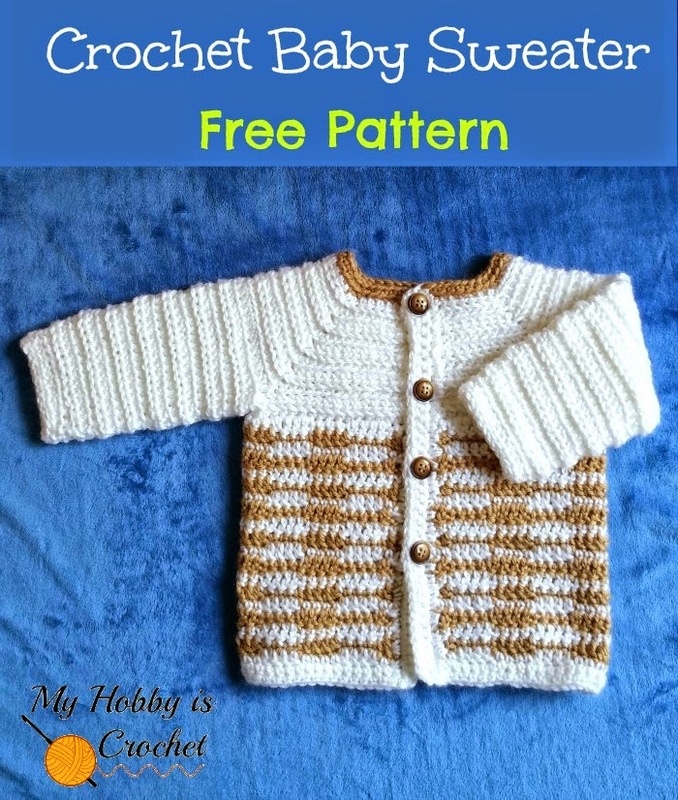 I hope you have enjoyed this pattern/ tutorial!